This morning I fiound a lovely short cut to the inner city through a food market, full of meat, fish and fruit stalls. What a pity I haven’t got access to a kitchen – it all looks fabulously fresh. I made my way back to the same cafe terrace as yesterday and sit In the late morning sunshine ‘eating’ a hot chocolate, and I suddenly realise the attraction. It reminds me of long-ago home. When I was a child my mother would serve an instant chocolate dessert and throw a bit of desiccated coconut into it. We called it ‘choc slosh’ and I loved it. If only I had some coconut now I could recreate the memory. I have often been reminded of this dish by smell but never before by taste. 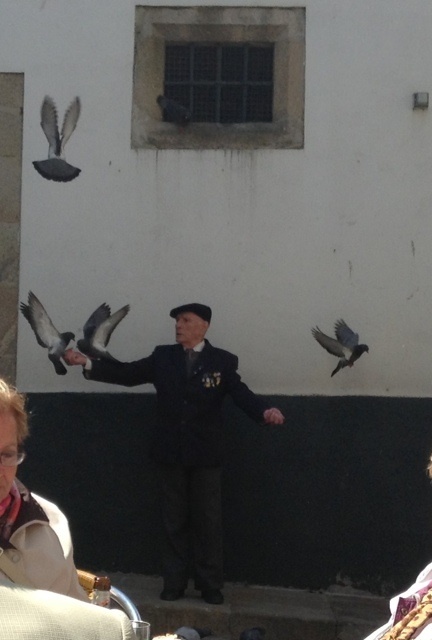 A lovely old guy walks by the bar and stops to feed the pigeons – he obviously does this on a regular basis. 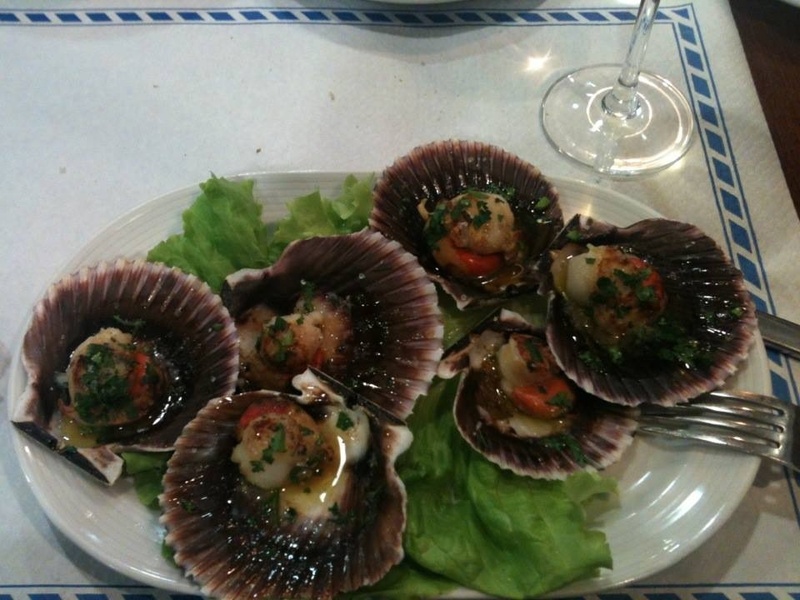 I treat myself to an extravagant lunch of scallops (zamburiñas), which I absolutely love but strangely have never seen served in our area of Spain. I also had them last night, and might well have them again tomorrow. I don’t believe in the saying “too much of a good thing”. This ancient city is definitely beginning to grow on me as it becomes more familiar. I can easily find my way around the narrow streets now and plot new short cuts. I haven’t visited any of the museums yet as I will do that with David over the next couple of days. So now I’m waiting for David to arrive in an hour or so, and my solitary confinement will be at an end. Have a lovely reunion with David…sure he has missed you. See you when you get back and have recovered…go for a ride yes? 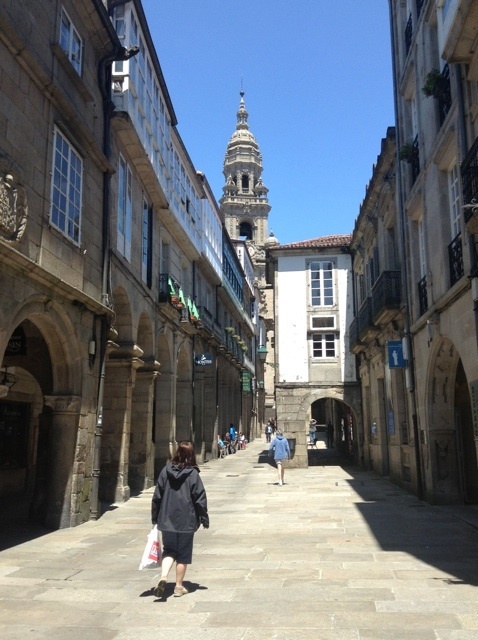 Just been reading your Camino blog posts from beginning to end, and really enjoyed them all. It brings back many memories – at least of those sections we have so far completed. Hopefully, 2015 will be the year we arrive into Santiago – all being well! Thanks for visiting my blog Jules and for your lovely comment. I wish you a grand finale to your camino and hope that the botafumeiro swings for you! There is a lot of road walking on the camino Portuguese. But the problem isn’t actually the roads, but what some of them are made of – cobbles, which can be uncomfortable to walk on. I would recommend footwear with a lot of padding under the foot. I enjoyed the route a great deal, there are so many places of interest that you walk through – particularly between Lisbon and Porto. I was very lucky that I walked the stages through industrial areas at the weekend, and there was virtually no traffic. I would suggest you try to do this also. And also make sure you have something hi-viz – after walking the CP and feeling a little vulnerable on a couple of occasions, I wrapped hi-viz tape around my walking poles and applied it to my backpack. 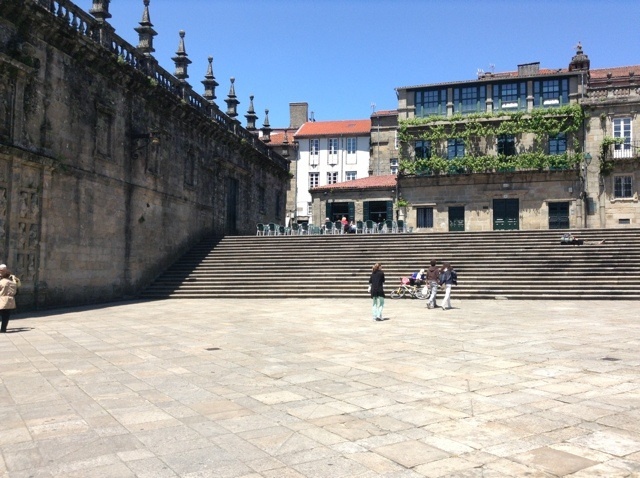 The worst day for me was walking out of Porto to Vilarinho (but that was in pouring rain). I would recommend taking the coastal option to avoid this section. A lot of the road walking is along country roads and through interesting villages which was fine. The busy/fast roads were not so many. I find it very difficult to compare one camino to another. They are all so different. I loved the CF and it was perfect for me as a first timer, but I wouldn’t want to walk it again because it is so busy. I really enjoy discovering new, lesser walked caminos. A mixture of walking alone with a bit of company during the evenings is perfect for me.